I find many clients who aren’t very techy tend to make some simple mistakes when creating and managing their email marketing systems. 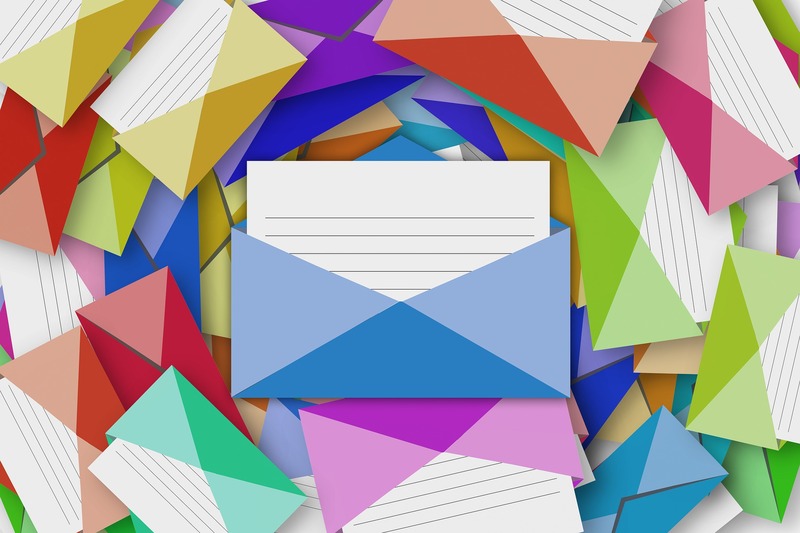 If you send a lot of emails, managing your sent emails, drafts and templates can be a challenge depending on the email marketing system you use. One client has several different email templates used by both the owner and other volunteers. While I’ve trained the owner on the best practices when sending out emails and organizing his templates, I see the same mistakes cropping up when I go in to create his monthly newsletter. Tip 1: Make a template and copy it. Don’t send it. Yes, simple concept, but easy to forget. Create a template to use for all your emails related to that particular subject. Then save it as a template. If you send it, you won’t have a template to use the next time. Copying and updating a sent email will work the first time around, but after several iterations, links get corrupted, as well as formatting. So, create your templates first and save them with names that include the message: COPY FIRST. DON’T SEND. This will serve as a reminder to yourself … provided you notice the template name and the message it implies. One particular client has several email templates for different purposes. You may as well. In Constant Contact, it’s difficult to find the templates if you have a lot and you have sent many emails to your clients. Constant Contact’s search function is not very useful since you can only search alphabetically forwards and backwards or by type. It’s not possible to search by date sent, and when multiple people use the account, getting everyone to use the same naming structure is challenging. Consequently, searching for a particular sent email can be time consuming. At least for your templates you can set up a system that’s organized using numbers for each one such as 01-name of template, 02-name of template. You can also use A-name of template, B-name of template, etc. Just don’t accidentally include spaces before the numbers and letters or before or after the dashes or in the template names on some but not all, since email systems, Constant Contact in particular, count those as part of the name. That will throw your organization out of whack. Examples: 01-name of template vs. 01- nameoftemplate or 01 – name of template. Consistency is the key when naming your templates in order to ensure they get organized properly. It is also key when creating your emails and sending them out. Unfortunately, it’s just too easy to copy that last email you sent out and update it instead of using a template. But what if the last email had some information in it you want to share again which is not in the original template? Select the html code for that article or snippet and copy and paste it into your template. Yep. If you created an article in one of your recent emails that you want to keep using – such as an event promotion – and it’s not in the original email template, copy the html code and paste it into the template. Then save the template. If you don’t know how to do that, contact me, and I’ll show you. If you’re looking to learn about social media and online marketing, you’ll find there are plenty of courses to choose from. Many focus on specific aspects of social media or online marketing so you can pick and choose the courses you want. That’s great. But there’s one drawback….it’s all piece meal. You learn about landing pages from one source and Facebook marketing from another. You get tips on building your LinkedIn and Twitter profiles from another. You can even take courses about content marketing and get tips on blogging. It’s overwhelming. How do you know what’s right for you and your circumstances? Just because someone is having tremendous success with Facebook doesn’t mean you will….not if your ideal customers are spending the bulk of their time on another platform like LinkedIn or Google+. So you have choices to make. You can try to figure it out on your own, enrolling in many of the excellent courses by the various online marketing gurus, or paying $30 a month on Lynda.com for thousands of different courses. Or you can try out my course at http://bit.ly/MktgSolopreneur. I’ve utilized a systems thinking approach® to marketing that starts with where you want your business to be at some future date and why you chose to be in business, rather than just how to do various online marketing projects. I’ve also incorporated best practices from the online marketing gurus, and applied them to a specific focus – helping entrepreneurs, consultants and solopreneurs put together a marketing program that works for them. The focus is on using LinkedIn, Twitter, landing pages, email marketing, and content generation as the tools to attract your target audience, your ideal prospects, and eventually convert them into clients. It’s comprehensive, targeted, and has step-by-step explanations of what you need to do to create and implement your social media marketing plan. I also provide resources that I’ve found very helpful that are either free or affordable to help you implement each phase of the marketing plan. But I’m the kind of person who needs to see the big picture first, to know what I want to accomplish, identify the steps to get there, and then set them in motion. In my years of doing online marketing, I’ve found how easy it is to get drawn down a rabbit hole and lose track of what you were trying to do in the first place. Let’s say you need to create a landing page. So you set up an account on leadpages or Instapage and choose one of their templates. You start customizing it, and then you realize, “oh wait. I need to provide a lead magnet people can download.” (That’s the free item you offer in exchange for the visitor’s contact information). But guess what? You haven’t created it yet. Crap! You now need to get out of the program, and go record a video or write an article or an eBook, or find something else of value that’s relevant to your target audience. Ok, so now you’ve got it all completed. You need to decide how you’re going to promote the page. Are you going to embed it on your website or use the landing page host? Darn. You need a custom domain, if you’re going to embed it or add it as a page on your website. Now you have to log into GoDaddy or some other platform to buy a custom domain. Of course you want to use key search terms that your ideal customer would use to search, but guess what, you haven’t done the keyword research yet. So first you need to do that. Then make a list of keywords you might use. Then check to see if they’re available as a custom domain (which they probably aren’t if they’re very popular). Wait. Why are you doing all this? Oh, right! You need this in order to put the landing page on your website! That’s where online marketing consultants come in. I’ve tried to make this process simple in the course. No, I haven’t spelled out step-by-step examples like the one above because I don’t know what your business is, who your ideal client is, and what platforms you should use. I’ve had to generalize because there are so many options. If I tried to cover them all, the course would never be finished. What I’ve done is to create worksheets you fill out that cover the key questions you need to answer. Then give you the tools to focus on the primary platforms that make sense for consultants and solopreneurs. I’ve created my own videos that walk you through the process of filling out each worksheet. I’ve also demonstrated how to perfect and tweak your LinkedIn profile. And I’ve included videos by others who demonstrate how to do things like customize your Twitter profile. There is a huge amount of content built upon my years of learning and perfecting for our own practice. I hope you find it useful. As a special promotion, I’m giving a 30% discount to the first 100 people who sign up for the course. There are still opportunities available, if you act quickly. Just use the coupon code 30percent on the checkout page. There’s a link under the full price which says, “Have a coupon?” Click that and enter the code 30percent, and you’ll get the discounted price. Once you’ve completed the course, I’d love your feedback about its usefulness and ways it can be improved. Just fill out the survey at the end, or drop me a line at jeri at dennergroup dot com. The answer is Yes, you can! The question is, can you use the Agile Decision Making Framework for anything besides strategic planning? 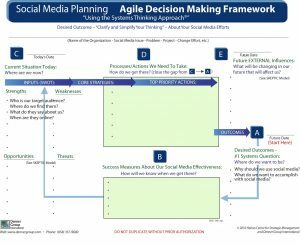 The beauty of the Agile Decision Making Framework is that it can be applied to any type of project – even marketing and social media planning. The framework helps you focus your thinking by answering five strategic questions as you work your way around the template. Many social media plans I’ve seen start with identifying your ideal customer and their specific needs. While this is important, it’s not the place to start. As with strategic planning, you need to start with your future outcomes. That way the actions you take are designed to help you achieve those outcomes. Otherwise, you’re just throwing spaghetti on the wall and hoping some of it sticks. Using the Agile Decision Making Framework, start with Phase A, answering the question, Where do we want to be? What do you want to accomplish through social media marketing? They should support the higher level outcomes of your organization’s overall strategic plan. Once you’ve determined which social media outcomes can help support those, you can begin to focus on your ideal customers and their needs. In the process, you’ll need to also identify which social media platforms they use the most so you focus your efforts there when you’re ready to take action. Once you’ve completed Phase A, move on the Phase E. This will help you identify the future external factors that could have an impact on the actions you take today. These become your future Opportunities and / or Threats that you need to consider so you’re prepared to respond should any of them occur. Why look at the external environment you ask? Because your business doesn’t operate in a vacuum. What happens locally and even globally can have profound effects on your customers, their needs, and their desires for your products and services. With social media, you have to continually be tracking these future trends because new platforms emerge and popular ones lose favor. You don’t want to be stuck on an island by yourself after your customers have moved over to another platform. If you don’t periodically focus on Phase E, you could be missing the boat! Once you’ve reviewed Phases A and E, you can move on to Phase B. This is where you identify the specific targets you want to reach and track through social media, answering the question, How will we know when we get there? These may include the number of click throughs on your links, or a specific increase in customer engagement on your Facebook page, or a percentage increase in website traffic and/or subscribers to your email list. The more specific, the better, so you can track your efforts and see what progress you’re making. Phase C comes next, answering the question, Where are we today? The first three phases were focused on your future outcomes, your ideal customer’s needs, external trends, and specific goals. This phase looks at your current situation. What are your Strengths and Weaknesses related to social media? Are you just starting? Do you have a strong team working in this area? Do you need to hire a consultant to help? How well do you know the various platforms – Facebook, Twitter, LinkedIn, Google+, Pinterest, etc.? How well versed are you with Google Analytics and Google Adwords? Those are the kinds of skill sets you want to list under your Strengths and Weaknesses. You should also fill out the Opportunities and Threats areas, which came from the external scan you did in Phase E.
By now, you should begin to see some major themes evolving. These become your high level strategies which you list under Phase D, answering the question, How will we get there? These are the specific actions you need to implement to close the gap between your current situation and your future outcomes. Some high level strategies might be training, hiring external talent, creating a social media policy, and customer engagement. Under each strategy will be specific actions you need to take, such as finding online training webinars, advertising for talent, researching social media policies you might adapt to your organization, and creating a content calendar. 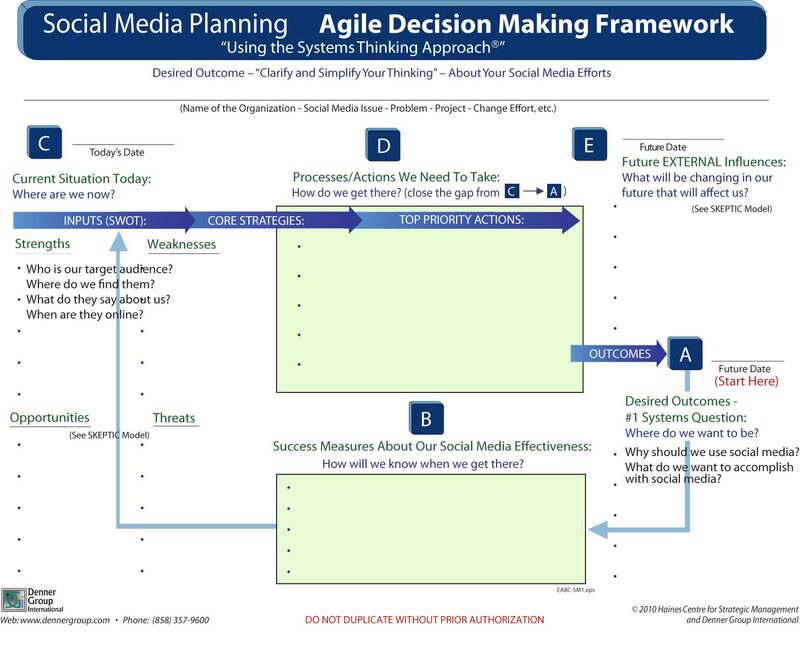 Using the Agile Decision Making Framework makes the process of creating your social media plan fairly simple and fast. The next step is to write it up and share it with your team. Then start to implement it! Planning without action is just dreaming. We all are pressed for time. After all, we have our businesses and consulting practices to run and clients to support. So where do you find time to write a blog? And why should you blog anyway? One reason is to stay top of mind with prospects and customers. Blogs are one of the most popular ways people learn about you and your business. And because they tend to be updated frequently, they’re more likely to show up in online searches. Blogs are one way Google and other search engines know they should check your site frequently to see what’s new. Blogs are also a way for others to share your posts with their networks. This helps you get found through social networks. Each blog post gives you the potential to generate new leads to your website, and having a call to action at the end of the post is one way to do that. Hubspot wrote a post listing 6 Stats You Should Know About Business Blogging in 2015. One of the stats is that marketers who use blogs receive 67% more quality leads than those who don’t. Another is that companies that blog receive 97% more links to their website. See the Hubspot post for more stats about blogging. If you hadn’t noticed, most of our articles in our newsletters go to our blog, which is also integrated with our website. This way we are driving traffic in both directions. Blogging gives you an opportunity to educate your target audience about your services and knowledge. By sharing valuable content your prospects are seeking when they type those keywords into Google, you become known as a thought leader and resource. Eventually, if you’re doing everything correctly (and there is a LOT to do), those prospects may turn into paying customers. And that’s the objective for most of us, right? Contact us to learn more about how we can help you with your social media and blogging challenges. We know story-telling is a powerful way to spread your message. Making stories memorable and compelling is the key. Have you ever sat at your computer looking at a blank Word document and asked yourself, “What now? Where do I start?” You have a message to share, but you want to do it in a creative way. You want it to be interesting and memorable and still get the message across. You need a hero. This is your customer. Think of one of your customers or clients who has taken what they learned from you and succeeded beyond your expectations. You need a goal. What was the customer’s objective? What became possible once they achieved the goal? You need an obstacle. What was preventing your customer from succeeding? Was it something outside the business or internal to the business or the individual? This is what makes the story interesting and something others can identify with. You need a mentor. That’s you! You are the coach, helping your client see the possibilities and overcome the obstacles. You need a moral. This is the main takeaway from the story. It’s where you tell others how you can help them solve similar challenges, and tell them what action they should take next. Be direct and to the point. Bonus: you need the truth! Now, thanks to Copyblogger’s Media designer Lauren Mancke and Demian Farnworth, we have a great infographic that summarizes Sonia Simone’s defining article on compelling story-telling. Below is the infographic providing tips for structuring and writing a marketing story. I’ve saved it as a PDF to use in the future. You may want to do the same. Takeaways: Consistent branding is important so your target audience recognizes you across all promotional platforms. Centralized control of the brand becomes more important as organizations grow in size. I tell this story frequently when teaching students about the importance of Branding consistency across all marketing and social platforms – from print to online. While working with a publishing company which consistently disbanded and then re-formed its marketing department (every 5 years), several marketing and advertising folks decided to showcase all the brands being used by the company. At the time there was no centralized control of how the brand was used, so every department created their own for use on letterhead, flyers, invoices, advertising, etc. The group took each instance of the logo and placed it on a continuous sheet of computer paper which they then rolled up and brought to a meeting of what remained of the marketing department. We met in the lobby conference room that easily held 100-150 people theater style. With a flourish, they unrolled the sheet of paper from the front of the room. It went down the center isle and out the door into the main lobby. There were more than 100 variations of the logo in use. Can you imagine how confused the customers were? Following that exercise, the department regained a “little” more control over the brand, and ultimately was tasked with creating an “official” logo to be used by all departments. The importance of branding becomes clearer the larger the organization. The moral of this story is that as organizations grow, it becomes more important to centralize and control how the brand is treated in print and online material. This extends to colors, fonts, horizontal and vertical layouts, and even the amount of white space allowed around the logo. If you don’t control the brand, everyone in the organization becomes a creative artist and will alter it as they see fit. Takeaways: Latin American consumers are tired of just getting discounts. They want to know that companies understand and care about the challenges they face. The trends in these countries are applicable globally. Latin American consumers (in Central and South America) are feeling the pain of economic realities in their countries caused by traffic congestion, diet, work-life stress. A new trend reported by trendwatching.com is Empathic Pricing. Consumers are tired of just getting discounts. They want to know that companies recognize and care about the pain they are experiencing – and offer assistance in dealing with it. Below are some creative examples. How might you implement something similar in your organization to win over more customers? Would any of these ideas make sense for you? Pain: São Paulo – to ease traffic congestion between 5 and 8 pm on central roads, the government instituted a policy that only allows cars with certain license plates on the roads during those times. That means those who have to wrong license plates must wait until after 8 pm to head home from work. Empathic Price idea: The PlayArte movie theater offered a discount on tickets between 5 and 7 pm to drivers affected by the government initiative. Pain: 72% of Chileans are trying to lose weight but they don’t have time in their day to fit in exercise. Empathic Price idea: Coca Cola outfitted a taxi with bicycle pedals as part of the Movimiento es Felicidad campaign (Movement is Happiness). Passengers that use the pedals to exercise while they ride earned a fare discount. Pain: For Brazilians armed robbery when leaving a restaurant is a real threat because robbers assume they and the restaurants will be holding cash. Empathic Price idea: The Twister Pub in Rio de Janeiro started offering a 5% discount to patrons who paid with credit cards instead of cash, figuring it would reduce the robbery threat once robbers realized patrons weren’t carrying cash. The Pub’s monthly revenue increased 15%. Pain: Growing old is painful. Period! Empathic Price idea: A Venezuela-based optician launched a 3-month promotion offering discounts relative to the age of the customer – 55% off for those age 55; 70% off for those age 70, etc. Pain: Brazilian summers can be glorious – or too hot. When it’s too hot, getting cool is the main focus. Empathic Price idea: a Brazilian etailer offered daily discounts on summer wear, air conditioners, and other “cooler” items equivalent to the high temperature of the day. While these are examples of Latin American trends that brands are stepping up to address, they have applications globally. The keys are to recognize the consumer pain points occurring in your own area, and think of creative ways to address them. Get personal with your customers. Ask them for input, and once you start down this path, don’t be surprised if they turn to you again when they experience yet another pain point.